What is a Rhode Island Sublease Agreement? Rhode Island Sublease Agreement: What Is It? A sublease agreement is a legal document used when the tenant of an apartment or rental property no longer wishes to remain in the property and finds a new tenant to take his or her place. This exchange is known as subleasing or subletting. Oftentimes, tenants want to sublease or sublet their apartment because they will be out of town for an extended period of time. 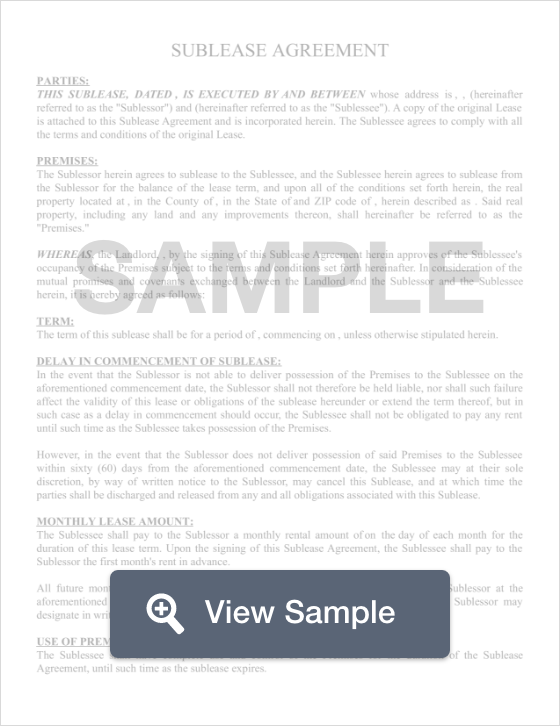 These types of agreements can be for periods of just one month to the duration of the lease. Though a sublease agreement is a legally binding contract, it's important to note that these types of agreements are peer-to-peer meaning they don't involve the landlord. If any late rent payments occur, or if the sublessee causes any damage to the property, it is the original tenant who will be held accountable, as it is he or she who has an agreement with the landlord. Rhode Island’s Tenant/Landlord Laws don't specifically mention tenant provisions on subleasing. This means that a tenants right to sublease his or her unit lies in the wording of a sublease agreement. If the landlord allows a sublease to move forward, the sublessor should seek to obtain written permission before.